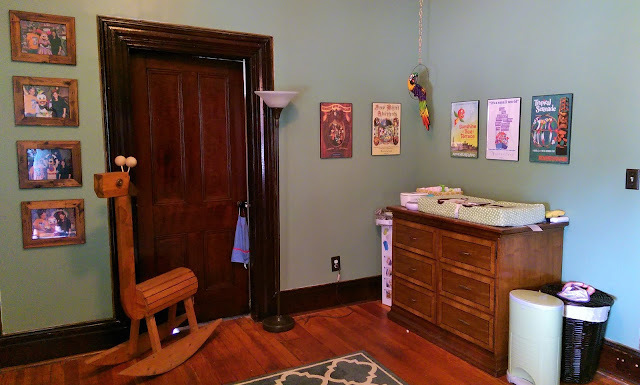 Franceth Manor: 39+1 - Nursery is Done! 39+1 - Nursery is Done! "Decorating" is not something that comes naturally to me. When I manage to put a room together by myself and it turns out looking like someone else told me what to do, I will walk around all puffed up like a peacock for weeks. That's how I feel about the baby's room! Our original inspiration was Adventureland at Walt Disney World & Disneyland, particularly Swiss Family Treehouse. 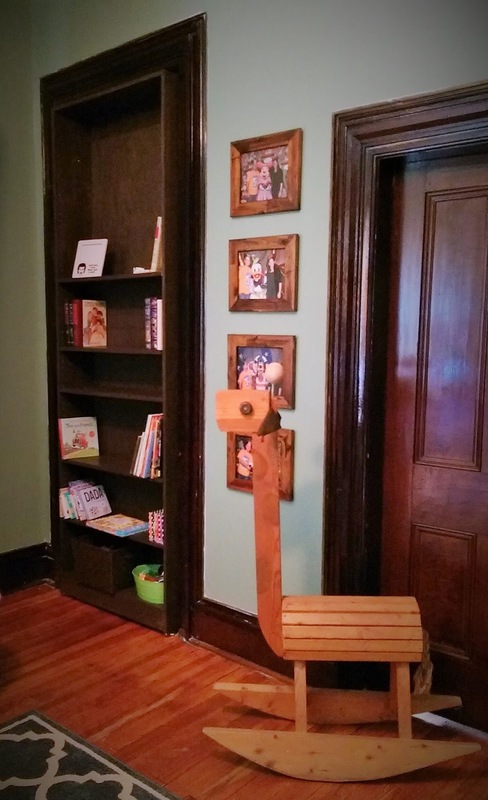 We wanted to use furniture we already had and only buy furniture that could be used in any room after the baby outgrows it. The "changing table" is a mini bar cabinet/dresser combo we got from Paradise Hospitality, a hotel liquidation company, here in St Louis. I think it is from a Mariott. We picked up the vintage attraction posters on our last trip to WDW, and used the rest of the pack our bedroom. The photo series on the left are the ones we took as announcement photos on that December trip, at Pete's Silly Sideshow. The bookshelves were built by my dad to solve a unique problem with this room: it connects to every other bedroom in the house. Behind that bookshelf is a door to our roommate's room with a transom, and we insulated behind the shelf for sound masking. The giraffe was build by my late Uncle Ed for me when I was a baby! It's very top heavy and we will be putting some chocks on the rockers to keep it from rocking. The high heel shoe chair under the World Market Bed Canopy is standing in for the Ashley Oberson glider recliner (purchased from the Exchange) we bought that is currently in our bedroom. 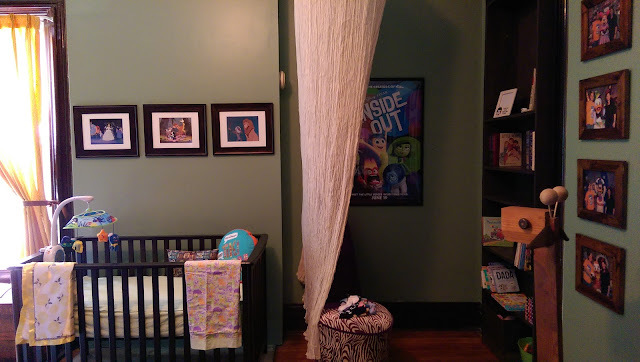 The Disney lithographs over the crib are a gift from Francis's cousin, and we won the Inside Out poster at a silent auction/trivia night. Francis found the shelf on top of the radiator in the alley one day, and the dresser from Paradise Hospitality was wrapped up in that curtain to prevent scratching. Score! 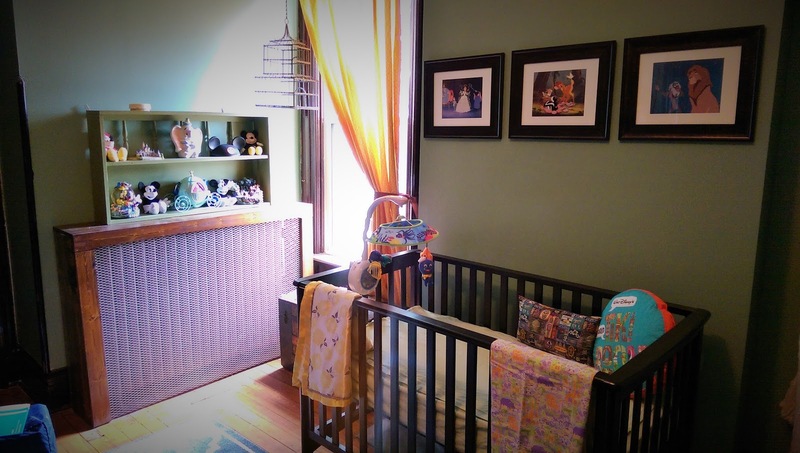 I really did not want to spend $500 on a "lifetime" convertible crib, because chances are this little girl will want some other themed room when she is older and I will cave on a pirate bed or something like that, so we went with the London Euro Style Crib from Buy Buy Baby. Some presents from friends, some stuff we already owned, and baby's first Mickey ears from our announcement photos. 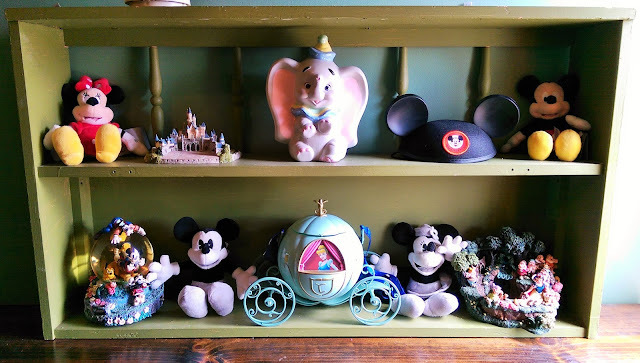 The original inspiration for the "Swiss Family Treehouse" theme was this chifferobe, which I did not want to sell or try to move to storage. 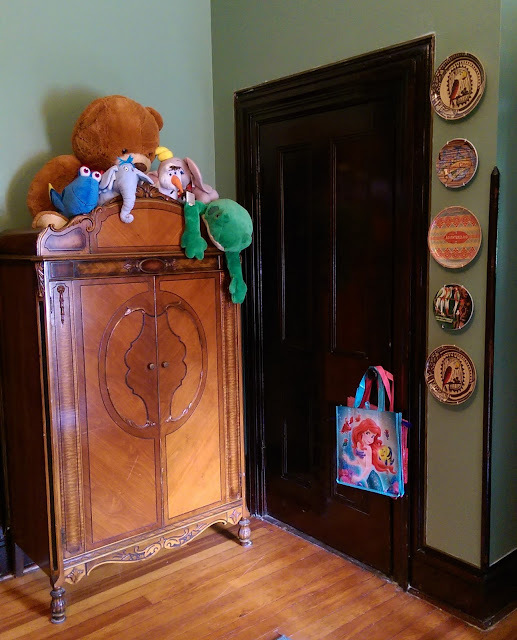 The matching dresser became linen storage out in the hallway. The little drawers and clothes rack are perfect for baby clothes and the top is nice storage for stuffed animals. I wanted some of the Adventureland signage from the Disney Store, but it is reeeeeeeeal expensive, so I went with plates instead! Can You Make "Real Money" With Direct Sales?